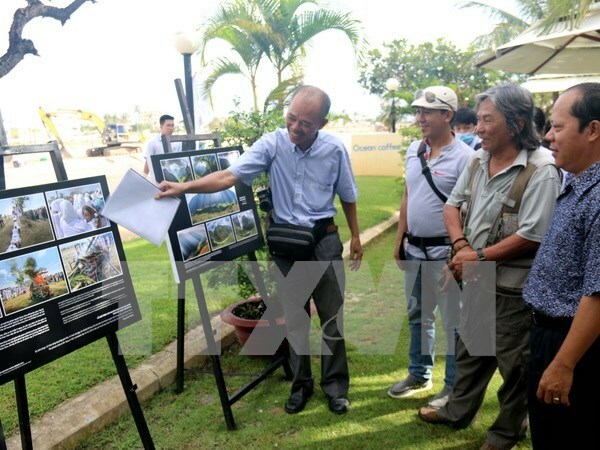 Binh Thuan (VNA) – A photo exhibition featuring Vietnam’s landscapes, daily life and culture opened in the central province of Binh Thuan’s Phan Thiet city on October 23. One hundred photos displayed were selected from the Vietnam heritage photo competition with five themes – rivers, nature, daily life, tangible and intangible culture. According to organisers, the photo contest attracted 5,446 entries from 507 photographers, including 14 foreigners. Head of the jury Hoang Trung Thuy said the submissions were captured throughout the country, with some of them taken underwater. They carry great artistic values, reflecting broader views of contestants this year, he noted. The exhibition runs until October 28. Similar events will be held in six other destinations across Vietnam. The Vietnam heritage photo award ceremony will be held in Ho Chi Minh City on October 23.